The strength of the Malta Command was 9430 men. There were 341 officers, 435 females and 813 children. In 1901, a new block of married quarters was built adjacent to Fort Ricasoli. 7 June Horace Edward Mills aged 9 weeks of St Julians. 5 Aug Rosalia Evetts aged 28 years. 9 Sep Maud Elsie Holliday aged 6 years was buried at Mtarfa Military Cemetery. 15 Sep Helen Kathleen Young aged 20 days of Sliema. 19 Oct Lillian Clara Hely aged 1 year of Hamrun. 4 Nov Infant Joseph Lewis Hully aged 2 months, son of naval store keeper Hully of Floriana. 15 Nov Infant Edward Henry John Solly aged 11 months, of Valletta. 7 Dec Barrack Warden William McLean aged 48 years of Sliema. The University of Malta held the privilege of nominating one graduate for a commission in the RAMC. On 5 Oct 1901, the Governor proposed to the War Office that a limited number of medical graduates of the Malta University, who had a thorough knowledge of English, should be selected at intervals for appointments to the RAMC, in the same way as nominations to it were made from the London Hospitals. The governor nominated Dr Benjamin Howard Vella Dunbar MD. However, from 1901, medical degrees granted by the University of Malta became recognised by the General Medical Council, and Maltese graduates became eligible to compete for commissions in the RAMC. Hence, the Secretary of State for War considered it inadvisable to make an exception in their favour to the rule of entry by competition. On 30 Jan 1902, the Malta Government was notified that the request of Mr Vella Dunbar for a commission in the Corps had been rejected. The Medical Act of 1858 set up the General Council of Medical Education and Registration of the United Kingdom. This regulated who was qualified to practice medicine in the United Kingdom and its colonies. However, the Act did not recognise colonial medical degrees. A doctor who had a British medical qualification was allowed to practice in Malta but one with a Maltese Medical degree had no status outside the island. In 1901, the British Government passed the Medical Act Extension Bill, which recognised colonial medical degrees. This enabled colonial practitioners to be admitted to the naval, military, and civil services of the Crown. As a result of the important services rendered to the Empire by our Colonies in the war in South Africa, and of the War Office having been unable to accept the professional services of surgeons of high standing in Canada who had volunteered, on the ground that it was contrary to the Medical Act of 1858 to permit a surgeon with colonial qualifications to attend professionally to British troops, a Bill was passed in the House of Commons to remove this disqualification, entitled the Medical Act (1858) Extension Bill. The Bill proposed an amendment so that the Medical Act would apply to a Doctor, or Bachelor, or Licentiate of Medicine, or Master in Surgery, of any university or medical school in the Empire at which the education and examination are regarded by the General Medical Council as equivalent to those demanded from candidates for the diplomas of the bodies in the United Kingdom specified in Schedule A of the Act of 1858. On 5 June 1901, the Education Committee of the General Medical Council recognised the Medical Degree of the University of Malta. On 26 September 1901, an Order in Council was passed extending the provisions of Part II of the Medical Act 1886 to Malta as a British possession. This allowed registered medical practitioners of the UK the privileges of practicing in Malta. On and after 1st October 1901, the second part of the Medical Act 1886 became applicable to the Maltese Islands.Two applications from Maltese graduates for registration on the colonial list were received in November 1901. There were 4 cases of smallpox in 1901. Three occurred among the troops at Fort Manoel; the fourth in a man under treatment at the lazaretto hospital for erysipelas. Surgeon General O'Farrell Thomas, thought that the contagion arose at the lazaretto hospital and spread via the air to the nearby hutments occupied by the troops. Mtarfa Barracks was commenced in 1891 and completed in 1896. A small hospital of 42 beds was also built at the same time as the barracks. The hospital opened in June 1901. It was used for all minor cases amongst the troops stationed there and at Fort Bingemma. All serious cases were transferred to the Station Hospital Valletta. The Barrack Hospital was used as a Families Hospital after the new larger hospital on Mtarfa Ridge was occupied in 1920. On 16 June 1898, the opportunity arose to buy Villa Portelli for £4,925. This was situated a short distance from the Naval Hospital and would have made an excellent residence for the Deputy Inspector General of Fleets. On 14 Nov 1898, the administration decided not to proceed. However, on 31 Oct 1901, Villa Portelli was purchased together with the adjacent land at Rinella Creek, for £13,000. 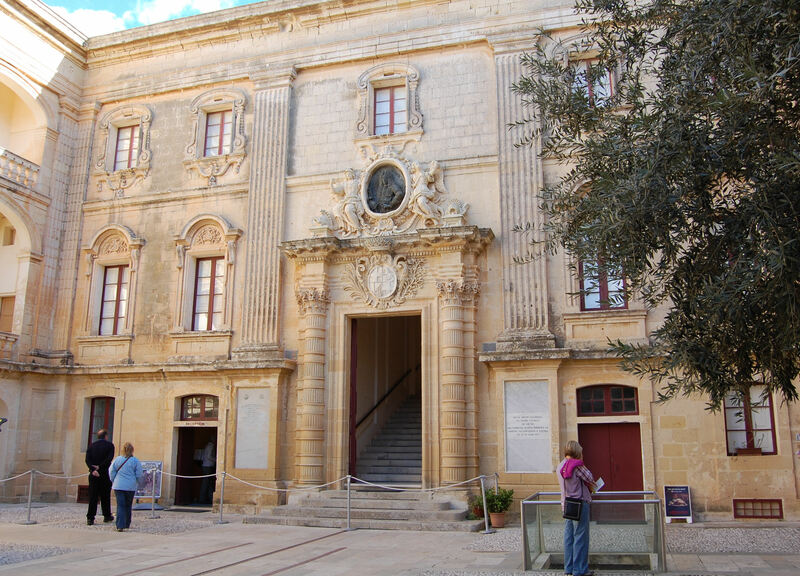 In 1860, the Grand Master's Palace at Mdina became a military sanatorium. 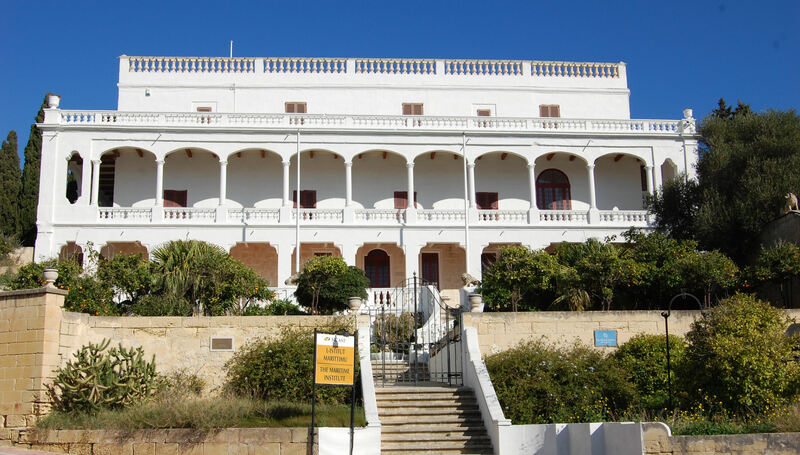 In 1860, the Grand Master's Palace at Mdina was converted into a sanatorium under the authority of the Rt Hon Sidney Herbert, Secretary of State for War, during the administration of Lt Gen Sir Gaspard Le Marchant. In 1901, the Sanatorium treated 920 patients as compared to 590 the previous year. There were 469 direct admissions, the majority being from Ghajn Tuffieha Camp; another 451 patients were transfers from various Station Hospitals. Ten females and 8 children were treated in the Woman's Sanatorium during the year. The Militia Regt and the Malta Militia Division of the Royal Engineers were established under Ordinance XII of 1901, by which previous ordinances with regard to the Militia were repealed. This empowered the Governor to raise a Militia by voluntary enlistment to be embodied in time of war. The Militia Engineers received training in submarine mining. The Infantry Militia attended training in musketry and a number of days training in camp and barracks. In 1901, the entire drainage of Notre Dame Barracks, Floriana was reconstructed, once the troops had vacated the barracks. In 1901, some of the troops at St George's barracks had to live under canvas due to lack of accommodation. New barracks, (St Andrew's Barracks), were built to rectify this problem, but these were not completed until 1905. The married quarters at St George's Camp were too cramped. Families consisting of four or less persons had one room which served as kitchen, living room and bedroom. Camp at Ghajn Tuffieha 1906. 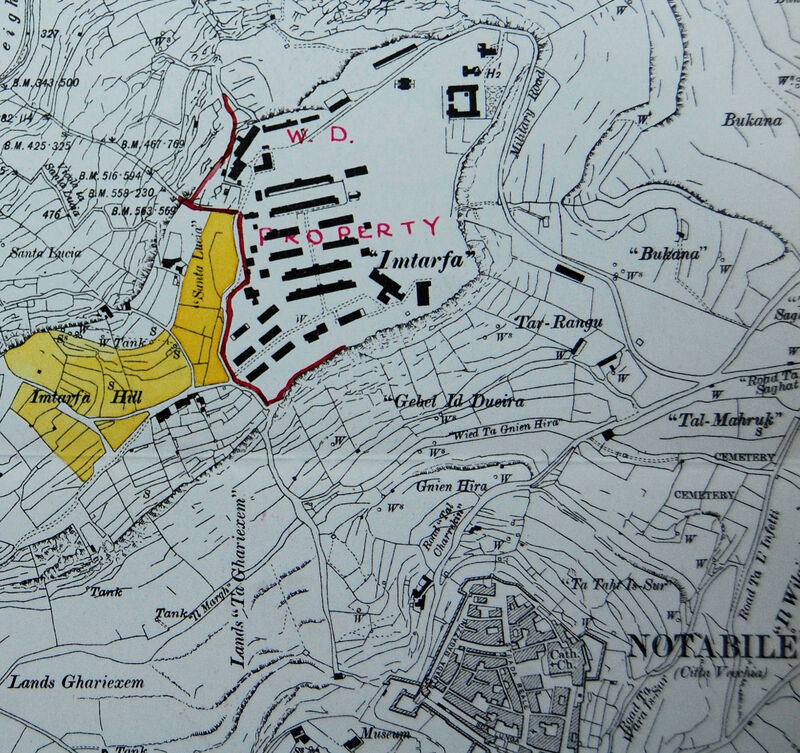 In 1901, a large military camp was set up at Mellieha Village, about 13 miles from Valletta. The number of troops stationed there was about 1000. A standing camp of the Mounted Infantry was established at Ghajn Tuffieha. Its permanent strength was 250 to 300 men throughout the year. The Order of St Francis (Franciscan Friars) cared for sufferers from leprosy. The Santo Spirito Hospital in Rabat formed part of their monastery. In 1862, in reply to a questionnaire sent out by the Royal College of Physicians, it was officially stated that leprosy did not exist in Malta. In the following 20 years, however, cases were noted and action was taken on 24 Aug 1893, when legislation was enacted to register and compulsorily segregate lepers. An additional wing to the poor house in Marsa was added to act as a leper asylum under the Ordinance No VII of 1893. On 11 Apr 1902, the Comptroller of the Charitable Institutions informed the government that he proposed to have certain new works carried out to prevent male lepers from escaping from the asylum. He also proposed to construct a new wing for female lepers. An Order in Council of 26 Sept 1901, provided £8000 for the construction of the building. The ground for the proposed additional buildings was rocky and unlevelled, which provided male lepers the opportunity to hide ropes and tools which facilitated their escape. Article 7 of Sanitary Ordnance No XVII (Regulation of the Medical Profession) dated 30 Nov 1901, prohibited physicians from practicing pharmacy. The Act did not apply to District Medical Officers when they had to provide the poor gratuitously with medicines from the Government Dispensary. Neither did it exclude those who had obtained their warrants to practice both the medical and pharmaceutical professions prior to 1 Jan 1873. The Ordnance precluded physicians and surgeons from having any interest in a dispensary. The governor alleged that doctors used conventional words in their prescriptions to ensure that these were only compounded at dispensaries in which they had a pecuniary interest. Other doctors were said to have had an interest in several dispensaries which kept up the price of medicines, while others were generally held to prescribe unnecessary and costly remedies. On 7 Oct 1901, Inspector General of Hospitals and Fleet Richard S. P. Griffiths recommended the purchase of a large field at the head of Rinella Creek. This was to serve as a recreational ground to the sick berth staff of Bighi Naval Hospital. No funds were available, but he received assurances that the matter would be reconsidered if funds were available with the annual estimates for 1903–1904. The new military cemetery at Gozo was consecrated by the Bishop of Gibraltar on 18 Feb 1901 in the presence of Maj Gen Lord Congleton, Commander Infantry Bde. The following chaplains attended: Rev P. Maynard Senior Chaplain, Rev W. C. Parr, Rev M. W. Churchward, and Rev T. H. Foulkes. The first recorded burial was that of Anthony Moore Banks, aged 8 mths, the son of Army School Master Banks, who was buried on 22 July 1901. TNA:WO 73/62, General monthly returns of the regimental strength of the British Army 1 January 1901. TNA:CO 158/335, 1901 January-March, War and Colonial Department, Correspondence Secretary of State. TNA:CO 158/336, 1901 April-June, War and Colonial Department, Correspondence Secretary of State. TNA:CO 153/336, 17 June 1901, Grenfell to Chambers. TNA:CO 158/337, 1901 July-September, War and Colonial Department, Correspondence Secretary of State. TNA:CO 158/338, 1901 October-December, War and Colonial Department, Sanitary Ordnance 1901. TNA:CO 158/339, 1901 Original correspondence, Secretary of State, despatches, offices and individuals. TNA:CO 158/341, Leper Asylum (11 April 1902). TNA:CO 158/343, RAMC and Malta Graduates, War Office 30 January 1902. TNA:ADM 121/49. Records of the Mediterranean Stations, Malta 1898 - 1904. TNA:WO 156/116, Burial Register New Gozo Cemetery from 22 July 1901. The Army List. February 1901. War Office 31 January 1901. The Army List May 1901. War Office 30 April 1901. The Army List Nov 1901. War Office 31 October 1901. Army Medical Department Report for 1905 Vol XLVII Lond 1906. Army Medical Department. Sanitary Report for the Year 1901, Vol XLIII, pp 69-81, London 1903. Distribution of RAMC Officers. Corps News Vol IV June 1905: No 6. General Council of Medical Education and registration Br Med J (1901), 1; 1409 (Published 8 June 1901). General Council of Medical Education and registration Br Med J (1901), 2; 1625 (Published 30 November 1901).